The YRD256-ZW2-605 from Yale is a keyless touchscreen deadbolt lock with Z-Wave Plus technology. It can store up to 25 unique 4 t 8 digit codes in its memory that can be shared with friends and family. These codes can also be tracked using the BILT app which can be downloaded onto your smartphone. The app provides a full walk-through upon installation, making it a great choice for both beginner and pro home automation owners. The keypad itself is weather resistant with illuminated numbers that won’t wear off which makes it great for climates with varied weather as well as for nighttime code entry. 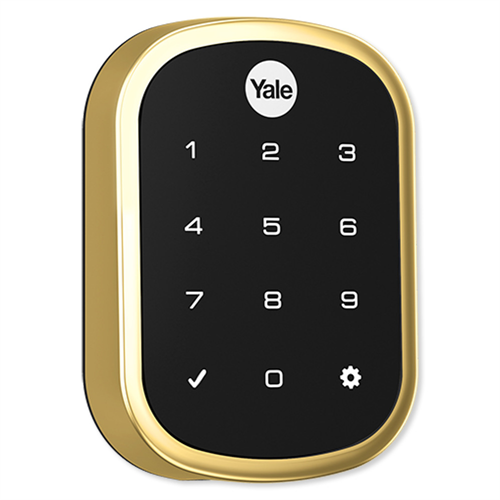 The keypad is battery operated running on 4 AA alkaline batteries and can be backed up in case of power failure and comes in a Bright Brass finish.